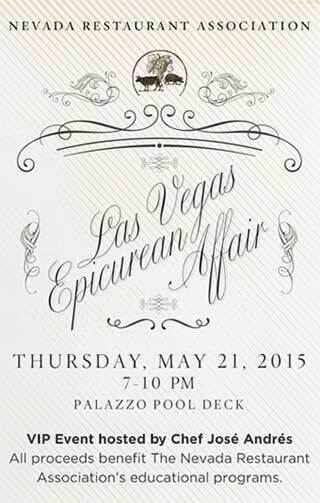 A gourmet event featuring savory cuisine and succulent cocktails is set poolside for an elegant and fun evening during the Las Vegas Epicurean Affair at The Palazzo Pool Deck Thursday, May 21, 2015 from 7-10 p.m. Nearly 75 of Las Vegas’ finest restaurants, nightclubs and beverage purveyors will come together for this foodie event in support of Nevada Restaurant Association’s educational and scholarship programs. Early admission includes access to the event an hour before the scheduled start at 6 p.m.
VIP admission includes entrance at 6 p.m., a VIP-exclusive reception from 7 p.m. - 8 p.m. with passed hors d’oeuvres, meet and greet with Chef José Andrés, and a special gift bag. Attendees and participants must be 21 years or older to attend.